The forced passage or not of iOS to Android is sometimes experienced as a painful moment. 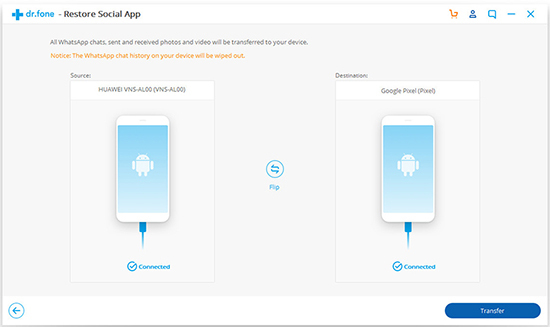 If all precautions have not been taken (regular backups to the cloud or an external drive), you will not be able to transfer all your data to your new Android device. For some people, phone to phone transfer is quite difficult. The same applies to all files and conversations in the Whatsapp IM application. 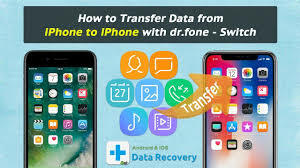 dr.fone software from Wondershare meets this need and offers you to easily transfer this data to your new device, whether it is an Android or iOS device. How to transfer data from iPhone to Android? We’re going to explain all! Before starting the installation you can customize it and choose the installation directory by clicking on “customize installation”. Make your choice and click on the “install” button. The installation will take less than five minutes; you may not have time to go for a coffee. A new dialog box will open at the end of the process; you just have to click on the finish button. dr.fone will launch automatically. Note that to use this software you will need to have the latest version of iTunes, the Apple File Manager. Without this software dr.fone will not work. To recover Whatsapp data from your iPhone, go to the last “More Tools” tab and click on the following icon: “Whatsapp Transfer, Backup and Restore iOS”. This small module you need to install allows you to transfer all of your WhatsApp conversations and attachments from one iOS device to another. Once the installation is complete (it only lasts a few seconds), click on the module icon again and the following menu will appear. Don’t worry because the following menu is easy to follow. You have four choices. We recommend that you back up Whatsapp messages before starting a transfer between devices. So you will always have a backup file reference in case of glitch. To do this, click on the second button “save Whatsapp messages”. 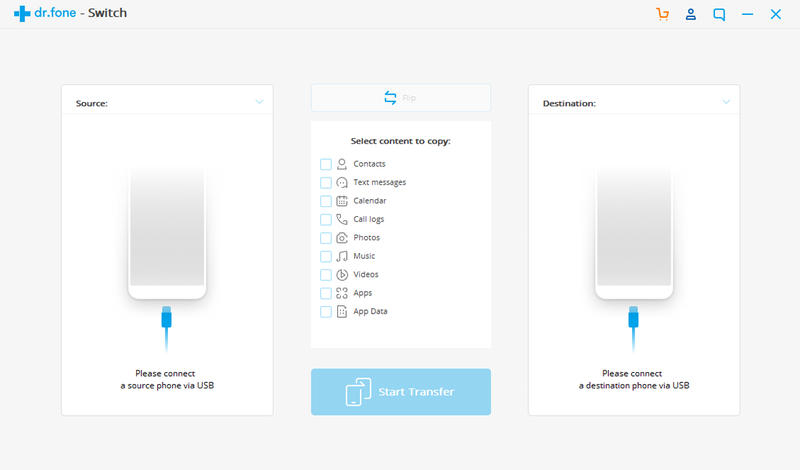 You can transfer all your recorded conversations without worrying about having to lose your important data. Just keep reading! Then connect your iPhone. A security message will appear at the time of connection. It will be necessary to authorize it by choosing the button “to trust”. The backup process will start. Its duration varies according to the size and the number of files exchanged through the messaging application. Once the backup is complete, go to the first section dedicated to transferring Whatsapp data between devices. Note that at the end of the backup all the application data on the source iPhone will be deleted. Connect the Android or iOS device that is supposed to receive the Whatsapp backup and click the transfer button. Note: If necessary, switch devices to have your Android smartphone set as the destination device with the “reverse” function. Very easy to learn, dr.fone offers other features that may be useful. Among these options we find: the system restore (in case of system bug, black screen …), the secure deletion of private data iOS (if you sell your device for example) and of course the management of backup files. Moreover, the latter even offers you the possibility to select individually the type of files to recover (SMS, photos, videos, contacts and call history). 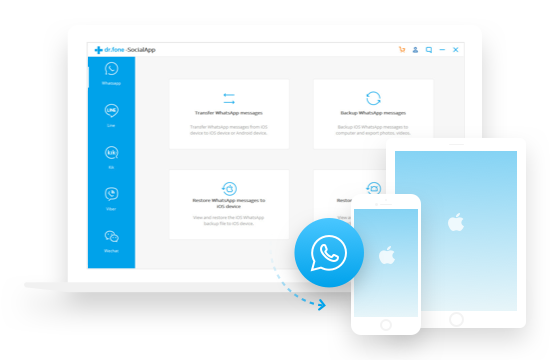 dr.fone is available on macOS and Windows. Just try this software and you’ll get a lot of benefits. Thanks for reading!